Authentication now works. This is provided by Google's Sign-In functionality, which takes a surprisingly small amount of code to implement. 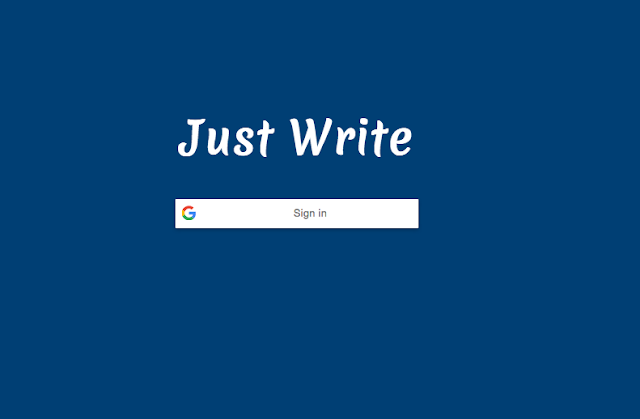 Just Write now knows the name and e-mail address of the individual who's at the keyboard. A storage strategy is now in place. Normally, I'd fall back to storing data in some AWS provided storage mechanism. But for the sake of trying something new, I'm experimenting with Flatbase: a flat file PHP storage solution. In this case, the opportunity to play with a lightweight, portable, server-less, zero-configuration storage solution makes up for the obvious lack of scalability. With these two hurdles cleared, all that's left is to implement the storing and e-mail delivery of submitted entries. At that point, it'll be time to switch from writing code to that other stuff. What's it called? Oh yeah, English. Check out the source code here, and play with the app itself here.